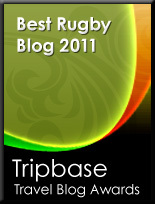 TOTAL FLANKER...a rugby blog: Bleep! 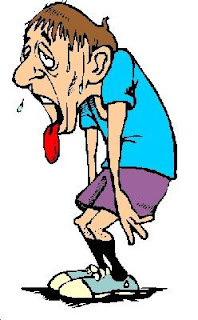 Last night I did something I hadn't done for at least 15 years - possibly longer: the dreaded Bleep Test. To be honest I'd thought that, along with New Kids on the Block, the Bleep Test had disappeared into oblivion in the mid-nineties but no, it appears that, like that much maligned American boy band, it's making a comeback - at least it is in Chesham. For the uninitiated (and I doubt there are that many of you) the Bleep Test is a continuous running exercise designed to test your VO2 max (maximum oxygen uptake), in other words your cardio-vascular fitness. The idea is that cones are set up 20 metres apart and the victims run back and forth between the cones in tempo with a pre-recorded bleep. The tempo increases every minute and the infernal bleeps come closer together and the basic idea is that you keep running until you can't keep up. After you've collapsed in a heap you're given a score based on which level you've reached. I made it to level 7 which either means that my training partner lost count or, as is more likely, that my cardio fitness is seriously lacking. Given that I'm sure that back in the middle ages I made it to at least level 11, my score last night was a pretty damning indictment of what age, beer and a sedentary lifestyle can do to your body. If cornered I'd argue that the test hardly reflected the fitness required for rugby (at least not the way I play it) but I'd be clutching at straws. To put things into context, apparently the Springboks in 2007 expected scores for the test to range from 11.5 for the props up to 13.5 for the backs (although a couple of our young whipper-snappers made it past that mark), English rugby legend Martin Johnson is said to have achieved level 14 in his playing days (we are not worthy) and rumour has it that Neil Back actually completed the test through to level 23 (inhuman). For those who are masochistic enough to want to hear how the test sounds, click here. Sorry for another long post, but you aren’t clutching at straws. I qualified as a fitness instructor a couple of years ago as a fun sideline to my day job, and I can think of a number of reasons why this test is pointless for rugby players. Maybe you can use this as ammo for getting your coach to stop wasting his and your time. One important aspect of testing is that a fitness test should be directly applicable to the sport concerned. Rugby does require good aerobic fitness, but doesn’t involve lots of jogging back and forth these days; nowadays it’s a sprint interval sport where short bursts of high intensity activity are mixed with short rest periods. Sure, that requires good aerobic fitness but there are better ways of measuring it which don’t stress the joints of big men so much, like cycling and rowing machines. Secondly, the bleep test is no use without factoring in the weight, build and motivation of the test subject. An 18 stone prop might have a higher VO2 max than an Olympic middle-distance runner, but he’ll never reach the same level on a bleep test, just as Seb Coe’s never going to bench press 300lbs. In fact, Neil Back’s Vo2 max was higher than many olympic middle distance runners, but he wouldn’t compete for a medal in the 800 metres. A heavily built person might stop the test long before reaching his VO2 max, because his knees and back are hurting or he’s getting shin splints. The lungs are still working fine but the high-impact nature of running back and forth is knackering his muscles (or he’s just getting bored and wants to do some bench presses and eat pies, as forwards should do). On the other hand, the middle distance runner might carry on running for two levels more than his lungs can really manage, simply because his lactic acid tolerance is so well developed and he’s motivated to run through pain. It is perhaps a good test for middle distance runners though, and many of them use it with real benefits. Even setting different standards for backs and forwards doesn’t solve the problem. Forwards range from little chappies like Neil Back, who’s smaller than most backs, through to huge lumps like Andrew Sheridan. Sheridan’s supremely fit but probably wouldn’t get close to Back on a bleep test. Likewise, backs range from Shane Williams, who’s smaller than my granny to Lesley Vainikolo, who’s bigger than most forwards. Nobody would be interested in a weightlifting contest between Shane Williams and big Lesley so why compare their ability to run for a long time? The result is a foregone conclusion. To sum up, all the bleep test really tells us about rugby players is that thin lightweight people can run for longer than big heavy people, and we don’t need to give people shin splints, back ache and knee injuries to prove that. Far better to spend the time wasted on a test like this on some good quality short sprint work that improves leg strength and speed off the mark and then a game of touch rugby where people get a good aerobic work-out that’s directly relevant to the game they’ll be playing in the season. He seems to agree that it's worse than useless. I had the reality check of having done this beep test last year. The only thing that made me feel better was that there were a couple of props almost 20 years my junior whose fitness was worse than mine. (How out of shape are you when you get beat out by a chunky 46 year old?) At that time I remember feeling every one of my (at that time) 46 years. The only thing that would be a harsher reality check would be trying to model a speedo. I never had a chance to retake the test, but I did alter some of my training, so for me, I think if nothing else, the beep test was a good motivator for me. You have put me to shame... my last beep test (Nov07) was a paltry 3.4 (level 3, 4th interval) - admitedly when my fitness was at an world record low. Perhaps it's time for me to lace up the boots? well it cannot be far wrong if they used it those years ago , michael jones, back, etc, it can still be sued for setting bench marks and you as the coach can set marks saying front row, 5, loose forwards 7 , backs 11, but as a training excercise it would be a waste as that should be position specific.Anyway I will be using it hated it in my day sure they will hate it now.